For those of you who don’t know what an edamame is (pronounced “ed-uh-MAH-may”), it’s a green vegetable more commonly known as a soybean. 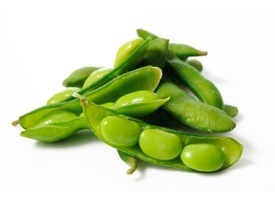 According to the edamame.com website, edamame is a green vegetable more commonly known as a soybean, harvested at the peak of ripening right before it reaches the “hardening” time. 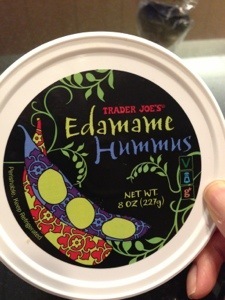 Just 85 grams, or 1/2 cup of beans, contains 9 grams of protein, making edamame a protein powerhouse. Your body needs protein as a source of energy and to maintain muscle. Our cells and organs, our muscles, our connective tissue, and even our bones could not hold together as the key body parts they are without the help of protein. Vegan’s and vegetarian’s are always searching for alternatives for substituting for meat-protein, and edamame would the perfect substitute. 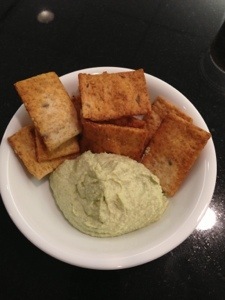 For breakfast, I had 2 tablespoons of edamame hummus with a handful of pita chips, and my grapefruit. It was delicious and crunchy. This was a very simple breakfast with a lot of protein. Not my typical breakfast but definitely one I will incorporate more because it was very filling and satisfying. I actually love edamame. Here’s a picture of the one I recently purchased from Trader’s. It’s very tasty!